Photo mugs have been a long standing tradition photo gift for many. We do realize that photo mugs are often a personalized gift for someone special so our service is just as personalized. If you have any questions about our photo mugs or an idea you may have, please contact us. Although we have been custom printing personalized coffee mugs and beer steins since 1996, we are still a small operation and like it that way. We never want to loose our personalized service in creating your memories. Rest assured, should you ever need a replacement mug at any time in the future, we retain 100% of all print on file. Think of the possibilities for personalized mugs. Print writing or drawing in your own child's hand? Photo manipulation and repairs for your photo mug. If you can visualize it, we can probably achieve it. your photo manipulation and design layout. Want to give your employees a token of thanks? We can print your company logo and have each mug personalized with your employee's names. We offer this volume print personalized service at NO EXTRA cost. 1 NHMugs.com is part of Elso Graphics, home of the original "Elso Photo Mug". 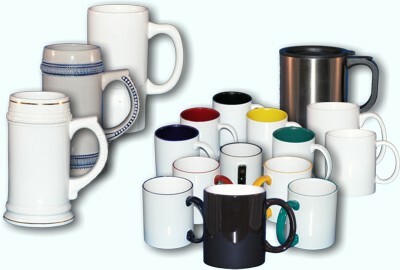 Our pricing for a single mug is competitive and we offer deep discounts for volume orders. Our discounts begin with as few as 6 like printed mugs.